Isaiah Ramsey texted his mom from his Patriots-themed bedroom. Stephanie Ramsey, not pictured, and her 15-year-old son, Isaiah Ramsey, routinely text each other while both are at home. 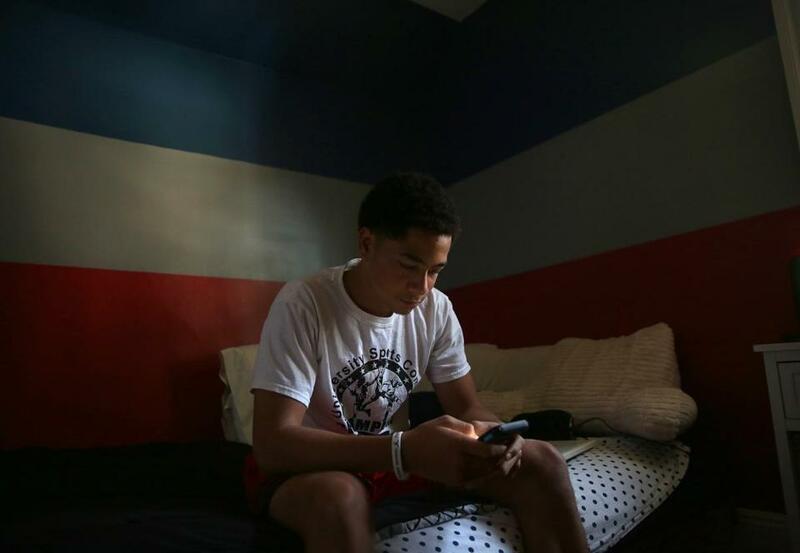 Tired and hungry after a day of high school and sports, Isaiah Ramsey likes to collapse on his bed, grab his phone, and place a mobile dinner order. To his mom. In the next room. In 2017, this is where we are: Texting, having transformed interactions between people in distant locations, has now conquered new turf. The texts are coming from inside the house. The old-fashioned intercom this is not. Entire dramas are unfolding, silently, between people separated by nothing more than an interior wall. Mothers and fathers eager to avoid in-person blowback are texting chore and homework reminders to teens who are a mere staircase away. Husbands and wives fearful of broaching sensitive issues are texting each other from the same kitchen. In Melrose, Gayle Saks got a text from her 16-year-old asking her to lower the air conditioning. “It’s freezing in here,” the girl wrote, from her bed. Saks took immediate action — and it wasn’t hustling to the thermostat. "Seriously Amanda???!! 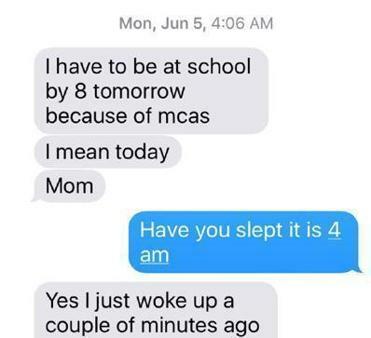 !” she texted back instantly. But Isaiah Ramsey, 15, doesn’t consider it rude to text his mom for a bacon and egg sandwich (hold the cheese) and a bottle of water. “It’s just like I’m talking to her,” he said. Ever since the first teen refused to look up from his phone to say a nice hello to his grandmother, the thumb-based form of communication has gotten a bad rap, demonized for robbing kids of the ability to make eye contact, or be present. Isaiah Ramsey, 15, doesn’t consider it rude to text his mom, Stephanie Ramsey (right). But some parents, spouses, teenagers — and therapists — are finding that texting can sometimes actually make a household run more smoothly (when parents aren’t outraged by their children’s chutzpah, that is). In fact, parents who were initially horrified at the seemingly impersonal communication mode have not only made their peace with it — they’re deploying it themselves. In Cambridge, therapist Kyle Carney said this type of family texting plan can remove the emotion from otherwise charged interactions, over, say, college-admissions prep, or wardrobe choices. “In a face-to-face conversation things might break down,” she said. Carney likened texting to another comfortable platform for parent-child communication: the front seat of the car, at night, with both staring ahead into darkness. But with Uber and other services driving teens around, and kids holed up in their rooms on their devices, the opportunities for relaxed conversation are dwindling, she said. But in many cases, texting is preferable to the alternative: yelling. These days, when a teen storms into his room and slams the door, he doesn’t scream “I hate you!” from the other side. He texts it. As in-home texting proliferates, standards for what’s acceptable — and what’s just too absurd — are changing. Many people consider texting so seamless that it doesn’t feel like an interruption — not even during a Patriots game, as Braintree hostess Sharyn Fireman has learned. When she verbally offers a guest a beer while the Pats are running a play, she said, “The hand goes up — no talking! But when she texts the offer, from her seat on her big couch — to a guest on the very same couch — she gets a text response right back.